- Fernando Sallum & Amazon Ensemble is finished producing the soundtrack for the movie "Mae Inini", a documentary on the indigenous people of Brazil. - An adventurous and lively debut album from one of the finest afro-jazz drummers around. - Thomas Wang produced and mixed Ila Auto's new single "Fagerborg" and is listed on norwegian radio P1. - We start work on Anita Hegerland's new album with a great bunch of musicians. Details to follow! October 2008 - Heroes & Zeros are going to Germany! - Songwriter & musician Trond Baardsen recently released his debut album and is now rehearsing at Urban. 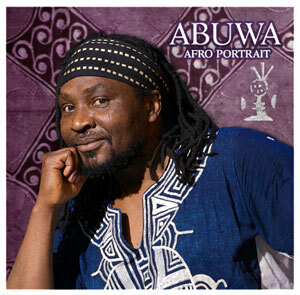 The norwegian cultural counsel has bought 500 copies of Abuwa's "Afro Portrait" for distribution to libraries and schools around Norway. October 2008 - Gear for Studio C arrived! - Tuesday october 7th was a happy day, when our gear finally arrived from across the globe. 2 new AKG C414, Universal Audio preamps, TL Audio tube compressors, large collection of Sennheiser and Audix drum mics, ProTools 003R setup, TC Powercore, 2 new ibanez guitars, and new apple cinema displays. - Finally we are done with most of the details in the new project studio. Take a look at the rooms here. - The worldwide known british group did 3 shows at the Opera house together with Bollywood star Rafqat Ali Khan. Urban Sound assisted with technical support, rehearsal and instrument rental. - We were contributing in many areas at this year's annual MELA Festival (Oslo international world music festival) at Rådhusplassen, Oslo. Rehearsal and transportation for artists, live recording, post-production of selected artist, equipment rental, technical assistance, and the often needed "chaos resolving"..
- Read interview with Erlend Gjerde, the carpenter and engine behind this national acclaimed metal band. August 2008 - Heroes & Zeros' "In the Slipstream vol.1" is out. - Thomas, with help from Fernando, has done all recording of this live album by the norwegian heroes. Two of the tracks were recorded at Oslo Spektrum when they opened for Smashing Pumpkins. - The norwegian Jazz-grunge-metal-group YTO is recording and mixing their debut album at Studio A.
Guitarist andproducer Thomas Wang is doing the whole production himself.